The Academy Awards is this Sunday, Feb. 26. It’s that once-a-year moment when all the stars of Hollywood gather and coronate the best of 2011. It’s the same here in our city. Only, this time, it’s sports. Timed just six days after The Oscars, Cebu will have its own version of recognizing the who’s-who of superstars. Called the 30th Cebu Sports Awards, this event is held every February or March in honor of the previous year’s top sportswomen and sportsmen. Each year, ever since the awarding started in the 1980s, two groups combine efforts to celebrate this event: the Sportswriters Association of Cebu (SAC) and San Miguel Brewery, Inc. (SMB). SAC and SMB will, once again, host the 30th Cebu Sports Awards next weekend — that’s on March 3 — from 3:30 to 6:30 P.M. at The Terraces of Ayala Center Cebu. What happens during the Sports Awards? The best of the best climb the stage to receive their plaques or trophies. You’ve got names like world champ Donnie Nietes, chess Grandmaster Richard Bitoon, weightlifter Christopher Bureros and cyclist Niño Surban, among many others. You also have first-time awardees like Millette Chiongbian (who conquered the 2011 Boston Marathon) and Leon Panoncillo, the WBO top honcho. And, of course, there’s that one person who’ll be adjudged the “Sportsman Of The Year.” He or she is that individual whom the sportswriters — the ones who decide on the awardees — feel contributed most to sports in 2011. Who’s the Sportsman of the Year? That secret — and the Athlete of the Year — will be unveiled on March 3. The Awards are divided into three categories. There’s the Citation Awardees, many of whom excelled in the national and local scene. There’s the Major Awardees, most of whom performed best in major national or even international events. Then, there are the Special Awards; including a Posthumous Award given to the family of the late long-distance runner, Melinda Ponce. MAJOR AWARDEES: ATHLETICS: Julius Nierras. ARCHERY: Dondon Sombrio. BASEBALL/SOFTBALL: Roel Empacis, Jonas Ponce, Darius Bacarisas, Jerome Bacarisas, Jasper Cabrera, Ben Maravilles, Oscar Bradshaw. BASKETBALL: UC Webmasters, UV Baby Lancers, Gregory Slaughter. BILLIARDS: Rubilen Amit. BOWLING: Ronnan Barredo, Alexis Sy. BOXING: Donnie Nietes, Leon Panoncillo. CHESS: Richard Bitoon. CYCLING: John Mier, Niño Surban. FOOTBALL: Don Bosco Technology Center HS team. JUDO: Kiyomi Watanabe. KARATEDO: Orencio James delos Santos. RUNNING: Mary Grace Delos Santos. SCRABBLE: Teodoro Martus. SWIMMING: Beariza Roble. TAEKWONDO: Glenn Lava. TABLE TENNIS: Richard Gonzales. WEIGHTLIFTING: Christopher Bureros. CITATION AWARDEES: ATHLETICS: Irene Baluran,Ernesto Ybañez. AUTOCROSS: David G. Lim. BADMINTON: Banilad Elementary School, UC high school team. BASEBALL/SOFTBALL: Jesse Bernad. BASKETBALL: Britt Carlo Reroma, Jerie Marlon Pinggoy, Dawn Hynric Ochea, Aldrich Ramos, Julio Sy Jr, SHS-Ateneo Passerelle champs, June Mar Fajardo, Andres Paul Desiderio. BEACH VOLLEYBALL: Apple Eve Saraum and Erika Camille Verano of USPF. BOWLING: Cebu Tenpin Bowling Association. BOXING: Milan Melindo, Rey Bautista, AJ Banal, Rocky Fuentes, Sammy Gello-ani. 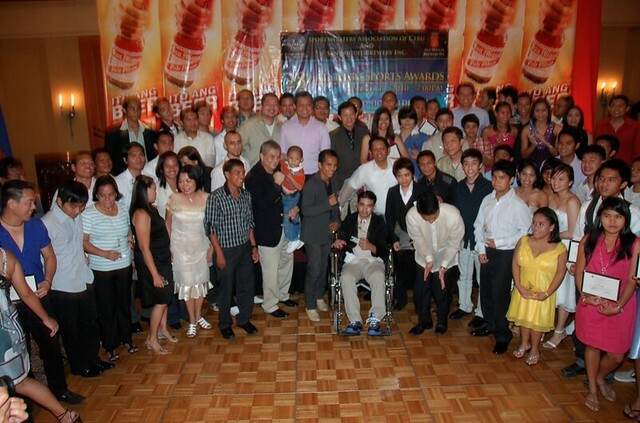 CHESS: IM Kim Steven Yap, CEPCA, Jack Tepora, Daryl Pucdol. CYCLING: Luis Maximo. DRAGON BOAT: Luis Ansag. DANCESPORT: Dancesport Team Cebu City. FOOTBALL: Jun Santillan, Jose Paolo Aragon Pascual, Oliver Colina, Glenn Ramos, Don Bosco Technology Center elementary team. GOLF: Lloyd Jefferson Go, Gio Gandionco. GYMNASTICS: Carmelli Garrovillo, UV team. JUDO: Eichi Yahata. KARTING: Jette Calderon. MMA: Johnlery Cañiga. MOTOCROSS: Jon Eleazar Adlawan. PENCAK SILAT: Marnel Dimla. RUNNING: Merlita Arias-Dunkin, Bayani Alvarez, Emily Chiongbian, Mary Joy Tabal, Mendel Lopez. RUGBY: Noel Flowers, Rose Mae Lanticse, Marie Antonette Gambito, Madille Salinas, Blessie Kate De Los Santos, Aiumi Ono, Eloisa Jordan, Mae Ann Ubaub, Ann Kristine Mae Layumas and Jessica Filoteo. SEPAK TAKRAW: Rhey Jey Ortouste. SWIMMING: Anthony Linn Navarro. TABLE TENNIS: Daniel Jay Tormis. LAWN TENNIS: Jacob Lagman, Arthur Craig Pantino, Cebu International Tennis Centre, Inc. TRIATHLON: Noy Jopson, Rochelle Tan, Lorhiz Echavez-Lopez.